Ready to discover new blogs, and find out more about who’s reading yours? Want people to know about your latest blog post -- and the interesting comments you leave around the web? Your TypePad profile tracks your comments from your favorite sites. We’ve made your profile even more fun: when you add your TypePad blog to your profile, we'll update your profile with your most recent post, so there’s more ways for people to connect to you and your blog. We’ve also added a new level of control over how your profile appears on the web. Hide specific comments if you want, or hide activity. Read our tips on how to customize your profile: change your URL, your photo, your nickname, and lots of other cool stuff. For existing TypePad bloggers, we’ve made a few changes to make your recent updates easier for your visitors to find. Since we all know that a short tagline can work to grab a reader’s attention, your profile will now display your “One Line Bio” instead of your “Extended Bio”. If you would like to use the information in your “Extended Bio” on your profile, simply copy the information into your “One Line Bio”. The greater social network is the web, and you’re at the center. You can add your other services, like Twitter, Facebook and more to your profile. Connect with your readers, wherever they are. This is just the beginning of some of the cool things we’re working on to help you find great blogs and new readers. Everyone with a profile will now have the ability to follow their favorite TypePad commenters and bloggers. [Spoiler alert!] There is so much more on the way. More great content. More readers. More from your friends at TypePad. Go to your TypePad profile. Want to learn more about your TypePad profile? Check out the FAQ. Did you know? You can see what your most frequently Tweeted words are with Tweetstats, and it'll build you a cloud of those words. Our most frequent? TypePad, Movable, Type, blog, and (our current favorite URL shortening service) icanhaz. Then from there, you can build a Wordle from your most frequently Tweeted words to put on your blog. Cool! Here's the full text documentation from our knowledge base (scroll down to 'Navigation Bar) and, for designers, tips on styling the navigation bar. Want to add your del.icio.us linkrolls, tags, or your del.icio.us to the sidebar of your blog? It's easy. Tthere's a tagroll widget, too, if you prefer to show us your tags. Got lots of followers on del.icio.us? Show off with your del.icio.us badge widget to let everyone know! Ali Edwards' blog [ A ] : capture. create. is a great example of how a TypePad blog can suit the look and feel of what you want to do beautifully. With links to her idea books, photos of her current scrapbooking projects, and a beautiful design, Ali's blog suits her credo of not making things more complicated than they need be, but still lovely in all ways. Visit [ A ] : capture. create. Go to Compose and scroll down. On the lower right, click on Display Options. Check the box for Feature This Post and then click OK.
You'll now see a 'Feature This Post' check box on your compose screen. Write your welcome message, back date it a bit. Be sure you check the checkbox to feature the post. Note: You can only feature one post at a time. If you had previously marked a post as featured, this new post will be featured instead. Save and publish the post. View your blog's homepage to be sure the welcome message is in the right place. Just in time for Earth Day, our friend and colleague Anil Dash has started a site with TypePad called Last Year's Model. The idea is that you don't need the newest and shiniest gadget just because it's newer and shinier. Choose to hang on to just one gadget you've already got that works - and appreciate it. Then blog about it, Twitter about it, and join the cause on Facebook. Visit Last Year's Model and take the challenge for yourself. Do you want to improve your blog but you're not sure where to start? Need some extra help launching a new blog? TypePad's expert Blog Services team are here for you! We evaluate your blog and provide tips on best posting practices, branding, custom domains and banners, and more. Then we take care of the recommended changes for you. Find out more and sign up to purchase one of our Blog Services at TypePad One. Kermit the Frog sang, "It’s not easy being green." And though there's no amphibian-puppet we respect more, we’d like to respectfully disagree. One of the things we feel strongly about at TypePad is taking care of our planet. We truly believe that every act of green—no matter how big or small—makes a difference. And we’ve noticed that a lot of you feel the same way. 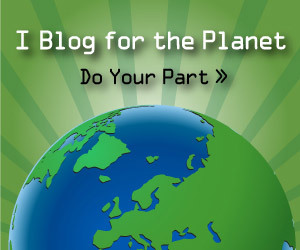 That's why we've created these Green Badges for your blog. Now you can show all your readers how green you are, and encourage them to get involved as well. Each badge links to the One Million Acts of Green in partnership with Cisco website. One Million Acts of Green is a collaborative environmental campaign encouraging everyone to go green. One act at a time. The goal? One million acts of green because, as we all know, we’re more powerful together than we can ever be apart. 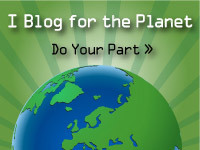 By putting this badge on your blog, you'll not only be spreading the message of the importance of going green, you'll be participating in an environmental campaign that could impact the world forever. And if that weren't enough, when the badges receive 100,000 impressions across the blogosphere, Six Apart will donate $1000 to The Climate Project. Do your part and add a badge today. And visit One Million Acts of Green and record your acts of green. Because together, we CAN make a difference. Choose your badge (scroll down). Click the button for the badge you want to add to your sidebar. You'll be sent into TypePad. Choose the blog you want to add the badge to. Click Add Widget. The badge has been added to your sidebars. If you want to change where the badge appears in your sidebars, go to Design > Content. Login to Vox click on You, then Change Your Design. The design page displays. Under 'Select a layout', click on 'Customize your sidebars'. A pop-up window displays showing all the elements you can add to your sidebar. Check the Embed checkbox and then click on the configure link. A second-pop up displays. For Widget Title, enter 'One Million Acts of Green'. For the Widget Code, copy and paste in the badge HTML code. Click OK and then Apply. Your badge is now on your blog. Login to Blogger. The Dashboard displays. Under your blog's title, click on Layout. The Page Elements page displays. Click on Add a Page Element. A pop-up window displays. For the element's Title enter 'One Million Acts of Green'. For the Content, copy and paste in the badge code. Click Save. The pop-up closes and takes you back to the Page Elements page. You'll now see the element you just created. Drag and drop it to arrange where it appears. Open your blog in a new browser window to view the new badge. Login to WordPress. Your dashboard displays. Click on Design > Widgets. The widgets page displays. Find the Text widget on the left. Click on Add to add it to your sidebars. A 'Text' widget now displays in your sidebar on the right. Click on Edit to edit the widget. Leave the widget title blank and for the widget content copy, paste in the badge HTML code. Click on Save Changes. To change the order of your widgets, drag and drop them to arrange them to your liking. Open your blog in separate window. Blogger, Vox and WordPress instructions above. We've got a full schedule of events with our own Professor Andy Wibbels coming up this month and next. All classes are free and available via teleseminar.